Katie has been at the salon since it first opened and is a very important member of the HOF team. Katie's first role was a junior assisting the stylists and helping the running of this busy salon. Katie was then promoted to head junior because of her hard work and dedication whilst she was in college and has always been focused on delivering the assistance and support the stylists need with there busy columns. Katie's next development was then to progress to the salons in house specialist colour technician due to her high skill set in this field. Katie excelled in this field and then progressed to be a full time stylist at the salon by completing an extensive Wella cutting courses as well as numerous colour courses. Since Katie's progression to being a full time stylist she has become one of the salons busiest stylists. Her extensive training, development, her knowledge and desire to be the best at what she does has made her a very confident hardworking styist. Katie is one of the many young exciting and talented stylists that work at HOF and this one of the many reasons the salon has a great reputation today. She loves her job and loves working for HOF and to see the stylist she has developed into since we opened is a very proud moment for the salon as to see the success and recognition she has from fellow stylists as it something Katie deserves due to all her hard work she has put in. 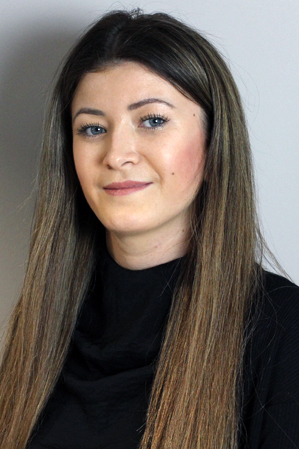 Katie is a member of salons highly skilled and talented specialist Blow Dry team that is trained to deliver the perfect salons famous big, bouncy Cheshire Blow Dry.